A chemical factory blast in China has killed at least 64 people, injured 657 others, and left another 28 missing, according to officials. The explosion occurred March 21 at a pesticide plant owned by Tianjiayi Chemical Company, located in Chenjiagang Industrial Park in the city of Yancheng, in Jiangsu province, and has raised concerns of air and water contamination in the area. Meanwhile, days after the incident, reports have emerged that authorities are blocking non-state media outlets from reporting the incident, as the communist regime seeks to monopolize the messaging. Aerial footage taken after the blast shows the factory completely destroyed, with a crater measuring over 100 yards at the epicenter of the explosion. Of the hundreds of survivors taken to the hospital, 19 are in critical condition, and 98 are seriously injured, according to official figures on March 24. Meanwhile, 28 people are missing. Locals, who didn’t wish to be named, however, told the Chinese-language Epoch Times that they are skeptical of the official figures, in particular, the number of missing persons. They said the hospitals were flooded with people searching for missing loved ones, such that they outnumbered hospital staff many times. The blast also damaged 16 neighboring factories and shattered windows on buildings located within three miles of the epicenter. The China Earthquake Administration recorded a magnitude 3.0 earthquake caused by the explosion. “All my windows were gone, even my doors,” Lu Peiyu, a villager who lives nearby, told Hongxing News on March 21. Lu said that most of the houses in his village lost windows and doors in the blast. He added that hundreds of villagers were injured but because the only clinic in the village had collapsed, the villagers had to travel far to hospitals for treatment. A local named Wang told state-run Beijing News that his 66-year-old mother died when their house, located 550 yards from the chemical factory, collapsed. Wang said his father was at a neighbor’s house when the blast occurred, and broke his nose from the falling rubble. When his father rushed home, he found that their house had collapsed, and his mother was buried in the rubble. “My father dug for my mother, and did CPR on her after found her in the rubble,” Wang said, adding that it was too late to revive her. Children from nearby schools were also hurt. Dozens of young children were bleeding from their noses and ears after the blast, according to Chinese state-run media The Paper. Nearby residents complained of the awful smell and taste of the fumes caused by the explosion. “My throat and nose are very uncomfortable [because of air pollution made by the blast],” Chen, a businesswoman who operates a hotel about 1.24 miles away from the blast center, told state-run Qianjiang Evening News. The state-run news outlet Caixin reported that toluene, xylene, styrene, chlorobenzene, sulfur dioxide, and nitrogen oxides were present in the air after the blast. The concentration of nitrogen oxides was, at one point, 348 times above normal standards. Local officials also found contamination in local water samples. According to official data from the Jiangsu Provincial Department of Ecology and Environment, water from all the three local rivers—the Xinmin river, Xinfeng river, and Xinnong river—all tested positive for chloroform, dichloromethane, dichloroethane, and toluene. Some volatile organic chemical measurements far exceeded surface water standards—by 15 times in one case. The incident has also triggered a round of censorship by the communist regime, with reports emerging of authorities denying and interfering with local reporters’ access to the site. 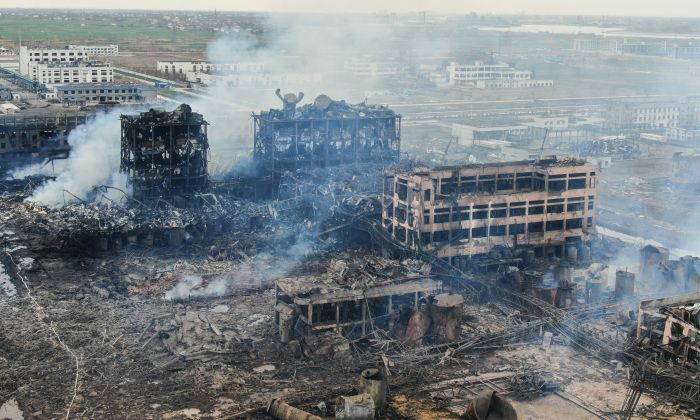 In the first two days after the blast, The Paper reported that the local government used a drone to interfere with aerial shots of the factory site. Since March 23, news coming from the site appears to have been blocked by authorities. A reporter whose surname is Wang told Radio Free Asia that the regime’s propaganda department ordered all media outlets to call back reporters from the site and to only re-publish official announcements about the incident. Censoring or controlling news about major disasters and incidents is commonly employed by the Chinese regime’s censors as it seeks to quell news that may tarnish the Chinese Communist Party’s image. The cause of the explosion is still being investigated, but Tianjiayi Chemical Company, which produces more than 30 organic chemical compounds, has been fined for work safety violations in the past. According to Beijing News, the company was fined six times between 2016 and 2018. The factory was closed from February to July 2018 after China’s State Administration of Work Safety found 13 safety violations, including improper storage of chemicals. The factory re-opened in August 2018. This isn’t the first chemical explosion at the industrial park in Yancheng. In 2007, another chemical factory in the precinct exploded. Dozens of reporters from other cities went to the site to report, but faced similar interference by the local government, according to state-run Business Network. In 2015, a similar explosion occurred at a chemical warehouse in the northern city of Tianjin killing 173 people, according to Chinese state media. Production safety has been a prominent issue marring the country’s economic development in the past few decades, with frequent industrial accidents triggering widespread public anger. Beijing News, citing official data, reported that 620 chemical production accidents occurred from 2016 to 2018, killing 728 people. The explosion occurred on the first day of the Communist Party’s Sixth Plenum, the biggest political meeting this year for high-ranking Chinese regime cadres.